AVAL - BRETAGNE’S ALL-NATURAL SMALL-BATCH APPLE CIDER 100% pure apple juice, harkening back to the way cider should be made. 6% Alc. No added sugar. 100% pure apple juice. Apples hand sorted and cut. Slow fermentation using natural yeast. Little filtration before bottling. 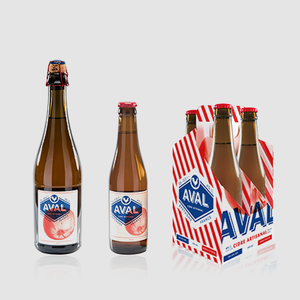 AVAL, translating to apple in Breton, the traditional language of France’s Bretagne province, AVAL is exclusively brewed on a family-owned farm in the region that’s been making cider for more than 1,000 years. And now, serious drinkers can taste for themselves what all the buzz is about — and why Brittany has been dubbed cider heaven by industry experts. A delightful, subtly sweet combination of four kinds of organic apples (acidic, bitter, bittersweet and sweet).